The Bitcoin blockchain fork came and went like New Years Eve 1999. Bitcoin is still the undisputed crypto coin BO$$!steemCreated with Sketch. Well the Bitcoin block chain split has come and gone and it seems to have been a nothing burger of an event. It hasn't really disrupted the price of BTC ,and it seems to have reinflated some of the alternative coins as of right now. I would urge investors investing in alternative coins to maybe set this out a little bit longer and see if any volatility arises over the next week. I did however recommend that you added more Steem to your wallet at the low prices it was at yesterday and we seem to have gotten a little bit of rise from that low. (You gained Bitcoin buying power from .000385 to .00045) I wouldn't be surprised to see Steem drop back down and test it's recent low again, but I also wouldn't be surprised to see it move up 10-15 or even 20% very quickly from the area that it's at right now. Listen ,the crypto coin game is not a get rich quick scheme. I'm sure all of you have heard of many of people who have gotten rich quick and you have made incredible gains in a very short amount of time, but this is a long-term game. This is forward thinking and to what the future might hold. Always remember you have absolutely nothing to lose until you sell those Alt coins . If your worried about losses you should have never invested into the Alt coin space because of its known inherent risk. Every single coin I have ever bought has gone up and made a crazy high after I've dumped the majority of my holdings on nervousness that this coin could become anything in the marketplace. A few times I've actually held coins that got the listed off exchanges. The moral of the story here is if you've taken your money and invested into a coin that has dropped in value and you feel like you're a bag holder...... hold onto that coin until it turns around and makes you a profit. There was a reason you invested into that coin. It was because you believe in the technology, you believed that there was some sort of need for that coin in the world. Those fundamentals should have not changed for you, and if you made a sound investment into a sound coin with a good block chain you're most likely going to recover all of your losses and much much more . All of you Reading my blog should consider yourselves the founders of the crypto coin markets. Yes, there are many people around the world using crypto coins but, in the big picture it is a small fraction of humanity. Feel lucky that you are here now, today and have the opportunity to earn free steam on this website before the rest of the world figures out what theheck is even going on! I'd be interested to know what most of you are doing with your BCC after the split. Are you selling it, are you holding it, are you going long-term with it, do you not know what to do with it? I have no idea what to do with my BCC, the smart brain in me tells me to dump it for a BTC while I can, and increase my BTC holdings or some other alternative coin that I like a lot. I don't think BCC is going to be successful, but it's hard to say because crypto markets are so brand new. Please comment below and let me know what you're doing with your BCC. As always, good luck and comments below that help our community or contribute to our crypto coin knowledge will be rewarded with nice upvote tips. . Thank you for reading my blog. Great point of view my friend. Did you just put BTC on the Mount Rushmore? I like to do things big son......just like the Broncos. It will take a long time until you see the Bitcoin logo on the 50yrd line of the 5280' though. I mean it's all speculation, even the stock market or your life insurance policy. The crypto space shows a lot of promise but getting rich in 60 days is too much to ask. Although I'm new in this crypto world, It makes me happy to know that nothing outrageous happened and this just confirm us that we ra on the right path. Your words inspire and like you said; it seems like a lot of people know about crypto and this world but actually we are a minority that is well positioned. Indeed I feel lucky. Best Regards! Thanks for reading man. Hang in there....one day at a time. I'm glad nothing majorly bad happened with Bitcoin. Passing through this will bring more general confidence into the crypto-currency market. That's my prediction anyway. ''this is a long-term game'' as you say and patience is a virtue. we should know that we can only achieve ,step by step. It's crazy it's worth that much. Yea I'm glad it's over, where you think BTC goes by the end of the year? Once BCC speculations are over, i expect BTC to reach 3k again, further predictions would be illogical. I agree with you ....I think we can see a range of 2300 to 3300 for the rest of the year. We gotta build a new base. The next explosion, run, whatever you want to call it should be a big one. Maybe the biggest move ever. That's why collection Steem for a while is a smart move. @broncnutz I am selling thw BCC for sure because I think the price will go down fast. Everyone seems to be confused that BCC is the forked BTC. No, it is not! BCC is a completely new currency. It sounds bad to me when they use BCC as their ticker symbol on the exchange because that ticker symbol is already used by another coin. Love the post - Great content - Cool Pictures and the perfect outlook !! Just another reason to move the markets by the gamblers. A complete non event. I'm pretty surprised it reached a market cap over 6B...Hopefully people throw it into LTC as its the superior coin imo. I would way rather hold LTC. LTC is so fast right now it's crazy. BCC is LTC expect it costs 10x more. Boss will all will be the BAWSE !! I think i'll wait a day or two before i pop the bubbly. I've seen this kind of thing take awhile to filter down to the masses. I mentioned in my intro how i have 25 Bitcoin somewhere, and would love to find it. But as far as im concerned, one day even small amounts of Bitcoin held now, will be well worth the wait. @broncnutz I just followed and upvoted you, Thanks! Looks like it was another false alarm like YK2 back in 1999. Like it was back in 1999 except it was the entire world was in a panic and not a few crazy crypto guys. 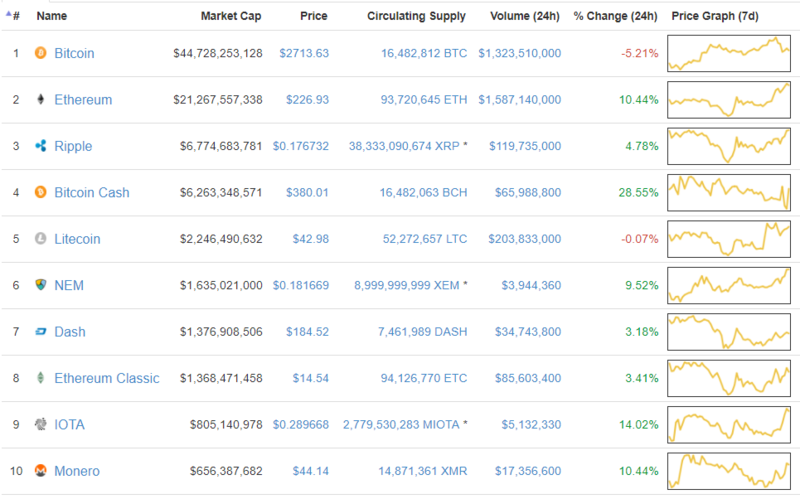 I see BCC has shot into 4th place on CoinMarkrtCap so anything can happen I guess. I thought after the fork bitcoin price will change tremendously . Kind of disappointed. It still might my man, there are a lot of newbies who don't know what to do.....heck I don't even know what to do. I expect BTC prices gonna move much higher but it may be volatile for a few weeks. I think buy, hold and protect Bitcoin is still the best play. My followers are way to smart for a tool like you. Lol....this dweeb posted the same thing three times here. Who are the beggars? Imma hold on to the .156 [i know very little] bch i got till the price goes up then sell to invest in GRC [NEOS was lower and i didnt hold on, still regret that :( ] it was free anyway so i did the best i could to get some. I didn't realise how well BCH would do. It is surviving and it seems like it is also thriving. Well at least it was a really smooth transition and nothing drastic happened. No major price fluctuations and we hit a total market cap of over 100 billion! Bitcoin is the no doubt the undisputed boss of cruptos but as far as btc price appreciation in last 2 years is concerned, it took BTC 7 years to reach that level. And going forward BTC may go to as high as 10000 usd in 2022, i have been associated with BTC since 2014, those days it were ranging around 250-300 usd. @broncnutz u r correct in your analysis of BTC. Most of analytics said BTC price will drop by 20% - 30%, but BTC again proved us it is the ALPHA, not only ALPHA, it has proven us (as you said) it is the BOSS!